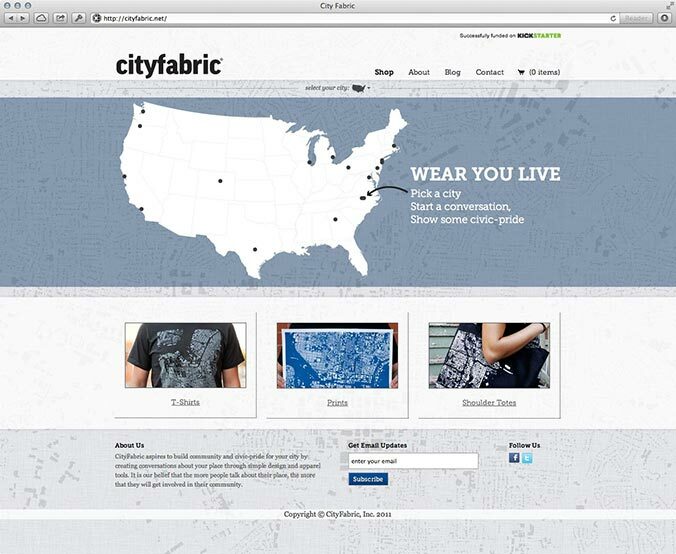 I designed and developed the website for City Fabric, a local business based out of Raleigh, NC. City Fabric produces t-shirts and other items printed with a special type of figure ground map typically used by landscape architects. The maps show urban density and are intended to start conversation. 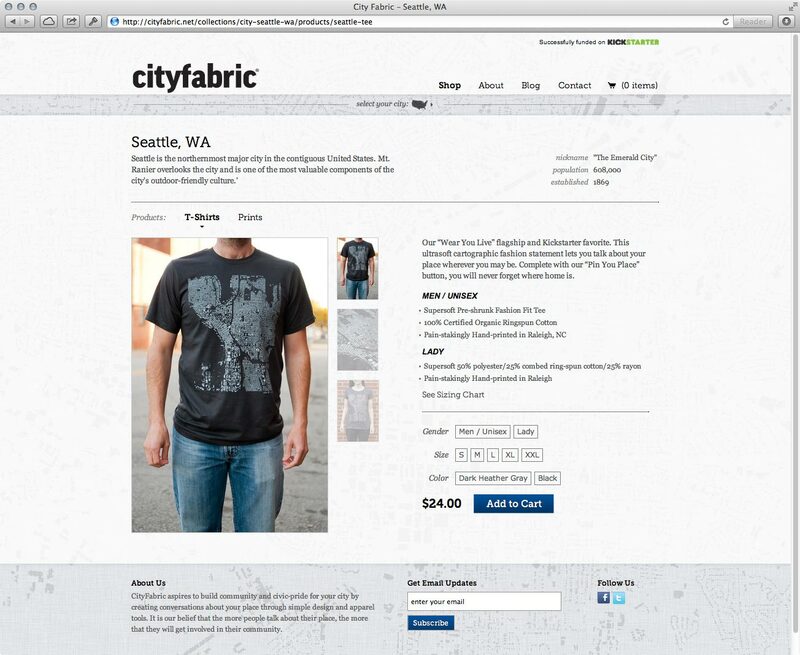 The website allows users to learn more about City Fabric and to browse and purchase their goods. 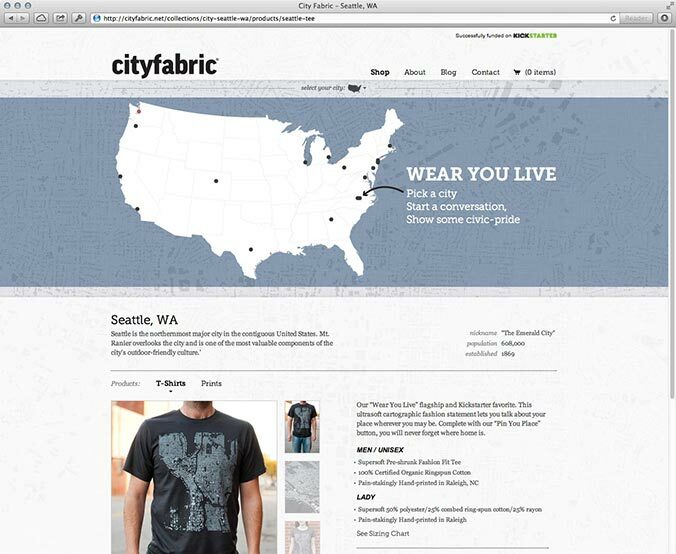 Users can browse by city using an interactive map or browse by product. Individual product pages give details and interesting facts about the mapped city. Please note: the current City Fabric website uses a different template. The screenshots below show the site as I designed it. The City Fabric homepage facilitates two main ways to browse the products. Users can click on their city on the map and browse all the products unique to that city. Alternatively, they can click on a product category below the map and browse all the unique cities for that project. Here the user clicked on Seattle, WA. They can use the product tags to view the different types of products available with Seattle's map. From any page, the user can expand the city map to jump to a different city. The map expands when the user hovers over the "select your city" bar for more than a half second or clicks on it.